We’ve tallied the votes, and just two girl names remain for March Madness baby names 2019! It’s an exciting moment, but a tough one, too – so many of our favorites get knocked out in the early rounds. And the SemiFinals are no exception. I feel like it happens every. single. year. The name I was so sure would be a lock to win the whole thing is just … gone. That star after Cora means that Cora won twice in a row, in 2014 and 2015. After those back-to-back victories, we decided against letting names defend their titles. 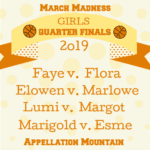 That means we started with the following sixteen names at the beginning of March Madness 2019: Phryne, Maisie, Lumi, Marigold, Oakley, Margot, Marlowe, Flora, Sloane, Evolet, Zosia, Esme, Noa, Maple, Elowen, and Faye. Now, let’s take a look at last week’s results. 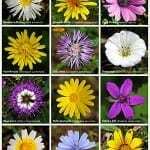 In a close contest, Marigold narrowly defeated Flora, with 52% of the vote. Vintage Flora seems sure to follow Nora and Cora up the charts. 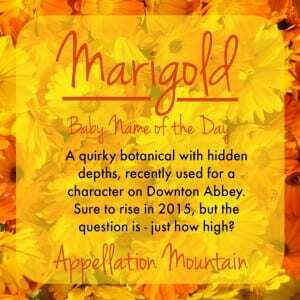 But then, Marigold also seems like an obvious choice, boosted by Downton Abbey and our love of so many flower names. 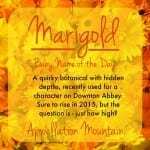 As it happens, Marigold fell to Eliza in last year’s Final, by the slimmest margin ever – a mere four votes! So let’s call this one to watch – both for the tournament, and for 2019. 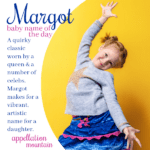 Read more about Marigold here. The outcome of this contest felt a little easier to call. Margot garnered 65% of the vote, and was steadily in the lead throughout the voting. It’s also the kind of name parents love – modern in sound, but rooted in tradition. Of course, you might say similar things about Cornish import Elowen. 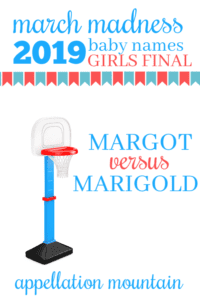 Still, Margot’s broad appeal carried the name to a SemiFinal win. Read more about Elowen here. March Madness 2019: Vote for the Winner! That leaves us with the Mar- match-up for our final contest. Voting will remain open until Thursday, March 28th. Come back on Saturday, March 31st to see which name joins our elite sorority of March Madness baby names winners! 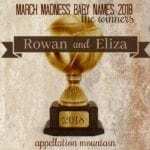 March Madness Baby Names 2018: The Winners!